6-17mm drop forged chrome vanadium steel spanners. Set contents: 6 x 7, 8 x 9, 10 x 11, 12 x 13, 14 x 15, 16 x 17mm. 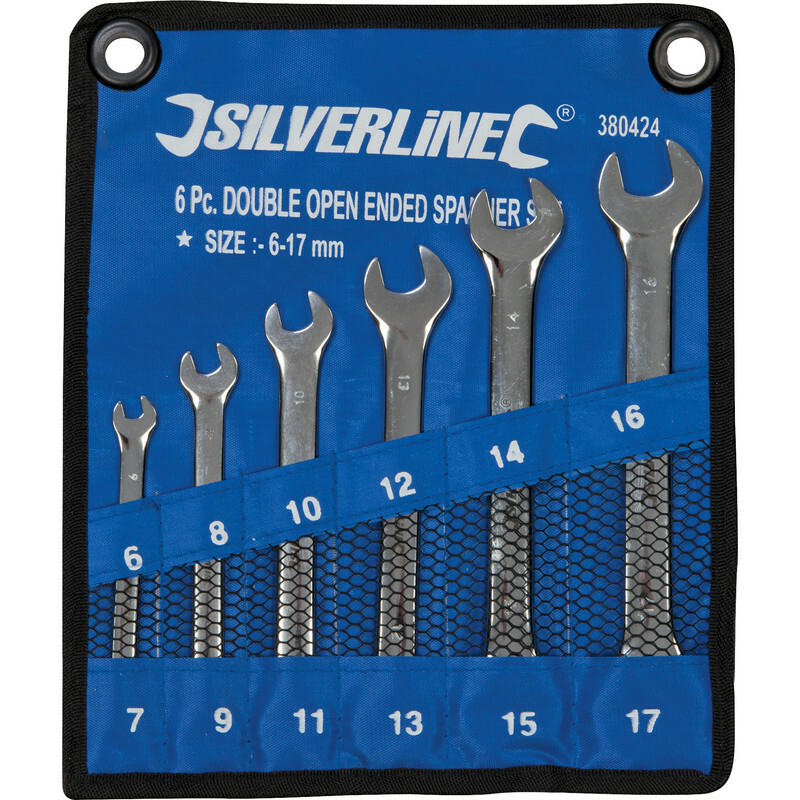 Double Open Ended Spanner Set (6 Piece) is rated 4.5 out of 5 by 14. Rated 5 out of 5 by AK1964 from Good price and quality I can recommend this product. Rated 4 out of 5 by MeasureTwice from Perfectly Okay for the price... Sometimes find Silverline products to be lacking in quality, however, these are fine for the price. Rated 4 out of 5 by Welwyntone from Sturdy spanners A useful set of spanners in a tool roll. Reasonably heavy weight, so I am hoping they will be of good quality. Rated 3 out of 5 by bost from 2 of the spanners the same (14-15) 2 of the spanners where the same size (14-15) and no size 16-17 so it must be some quality assurance/check issue. I had to go back to toolstation to get a new set next day. The spanners are good quality. Rated 4 out of 5 by David M from Good price Needed a 9 mm spanner and bought these for the same price as the one I needed....no brainer.